Curator Dr. Katherine Ott invited students in Dr. Samuel J. Redman’s Museum/Historic Site Interpretation Seminar to explore the museum’s disability history collections and write blog posts sharing their research. Read more on disability history by the student bloggers. Large tube-shaped machine with six legs on rolling wheels. Blue in color with small windows. 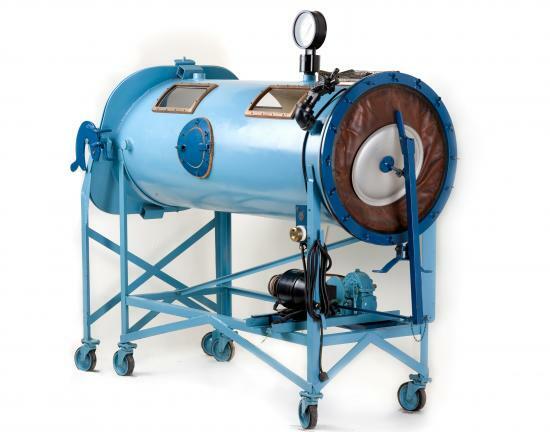 An early version of the iron lung built in 1931. This device was first used in the Providence City Hospital in Providence, Rhode Island, and is in the museum’s collection. The “strange machine” O’Brien found himself in was a tank respirator, commonly referred to as an iron lung. Invented in 1927 by Philip Drinker and Louis Agassiz Shaw Jr., the iron lung became a staple within medical facilities after John Haven Emerson designed a more cost-effective device four years later. Iron lungs were used during the early stages of polio when the virus attacked the central nervous system, which in extreme cases led to the inability to control the muscles responsible for swallowing and breathing. After a few weeks, most patients recovered and were able to breathe independently, but some, like O’Brien, required the use of assistive respirators for the rest of their lives. The iron lung ward in 1955 at Haynes Memorial Hospital in Boston, Massachusetts, 1955. Black and white photograph with five people in iron lunch machines, their heads on small pillows. Nurses with face masks and white hats attend. As O’Brien describes it, an iron lung was a “horizontal metal cylinder on legs, about three feet wide and perhaps eight long, weighing about 650 pounds.” Inside the cylinder was a movable mattress that gave the iron lung the more endearing nickname of “the cookie tray.” The head was the only part of the body visible, sticking out at one end with an adjustable collar fit around the neck to keep the device airtight. Tank respirators operated like a vacuum with a motor creating and releasing pressure around the body. Air would be pushed into the lungs as decreased pressure forced the chest up. The lungs exhaled when the vacuum released the pressure, pulling the air out. Iron lungs were one of many assistive devices used to help patients breathe, but none were as effective and reliable as the iron lung. Black and white photo. Woman with glasses sits in striped, very upright chair. Large piece of machinery presses on her chest. Tube connects from the machine to her mouth. 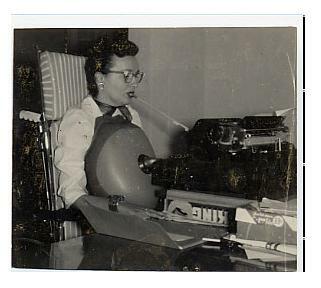 A typist using a cuirass respirator, 1958.Cuirass respirators functioned similar to iron lungs, but applied pressure to a much smaller surface area and were portable. Despite being paralyzed, patients encased in the protective steel of the respirator became suddenly aware of their bodies. They were forced to relearn the most basic activities of life—breathing, eating, and talking. In his memoir, Larry Alexander, who contracted polio in his twenties and spent the rest of his life using an iron lung, remembers his realization that speaking can only be done when exhaling. “In the lung my exhalations were fixed and rigid. If I were in the middle of a sentence when my breath was finished, I had to wait till the next one came to continue.” Eating and drinking also had to be timed to the rhythm of the machine to avoid choking. 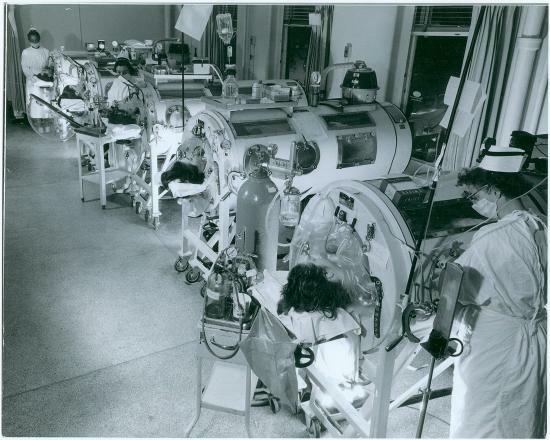 For those who permanently lost the ability to breathe, the iron lung became a part of their physical being. Black and white photo man with beard and glasses and friendly smile turns to face camera, wearing tie with apples on it. He sits in a “Nightwind” branded wheelchair. Trees visible in background. 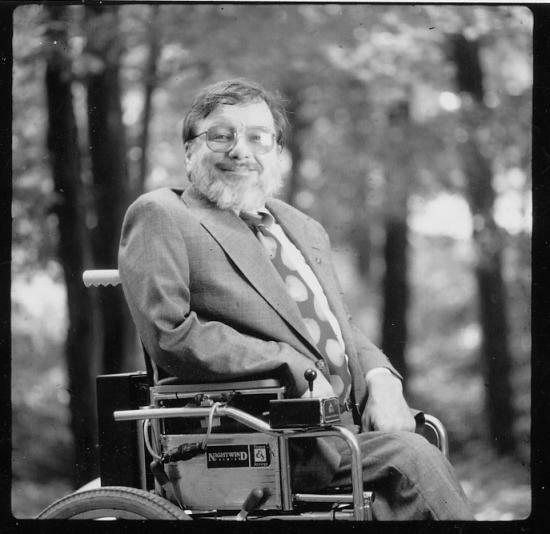 Ron Mace, who contracted polio as a child, became founder of the field of Universal Design in the 1960s and ’70s. Universal design ensures equity in public spaces and facilities. Color photo of young man in Iron Lung machine, his head on a blue pillow. Photos and stickers decorate the machine. Family photo hangs on wall behind him. 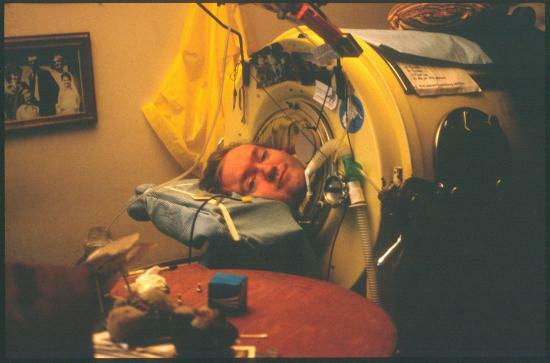 Mark O’Brien in his iron lung at his parents’ home. Courtesy of Jessica Yu. 1996. On July 4, 1999, Mark O’Brien passed away in Berkeley, California, at the age of 49, having obtained the freedom he desired. In 1978 he enrolled as an undergraduate at University of California, Berkeley, eventually graduating with a master’s degree in the school’s journalism program. While there, he cultivated a love for writing and poetry, which he used as an outlet for civil rights activism. His first published essay in CoEvolution Quarterly printed in the spring of 1982 “combine[d] the elements of autobiography with an argument for independent living.” Rather than placing disabled people in nursing facilities, he fought for attendant programs that hire people to work in homes rather than hospitals. O’Brien realized how different his life would have been without this form of healthcare and worked to extend this advantage to all. He shared his life story with the hope of improving the rights and legal protection of the disabled community. Esta entrada fue publicada en Polio, Post Polio, Sabías qué?. Guarda el enlace permanente.